Since learning about herd immunity, I’ve become more and more sympathetic to this view. After all, when people refuse vaccination, they are refusing to help those who cannot receive the vaccination for medical reasons, and if enough people refuse vaccination, even those who are vaccinated can become infected through over-exposure to the disease. This is clearly a public health issue, and it is hard to respect those who refuse to vaccinate. However, I understand the way many anti-vaccination people think; I used to be one, myself. Therefore, I see problems with certain solutions that others may not. One solution would be to make vaccination absolutely mandatory: no exceptions except medical exceptions. This could be forced under threat of fine or imprisonment. There are several problems with this solution, the first being that it is extremely difficult to enforce. Not everybody takes their child to medical doctors as a primary care physician; I myself was taken to a chiropractor, and he gave lectures against vaccines. 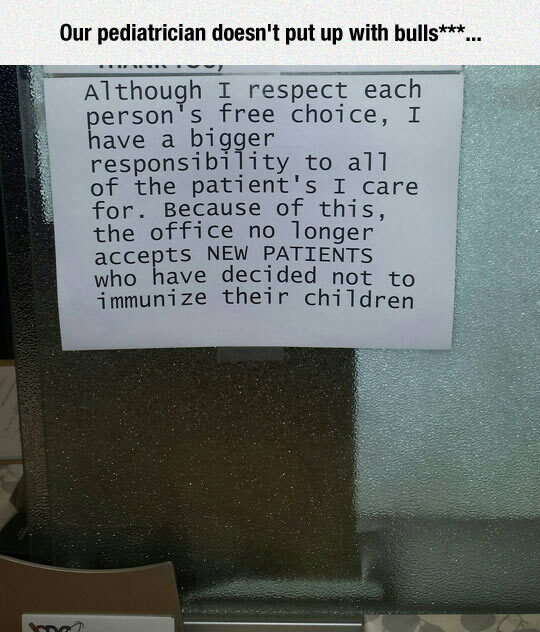 Further, not every medical doctor is unsympathetic to the anti-vaccine movement; the one my family goes to when they do go to a medical doctor is, apparently, completely willing to support it. For another thing, many of those who don’t vaccinate also don’t trust the government, and if the government starts forcing them to inject what they wrongly perceive as poison into their children, I think the anti-vaccination situation will grow even worse. The solution of making vaccines mandatory for public school shares many of the disadvantages already listed, but I think it has another one: many of those in the anti-vaccine movement are homeschoolers. They do not want their kids in public schools, and this will just give them another reason to stay away! Still, though this is a partial solution, it is not necessarily a bad one: children are most at risk from the anti-vaccination crowd. Some argue that this would be coercion. I think vaccination is so necessary for public health that it should be done regardless. I’m not admitting it is coercion; I’m saying it should be done even if it is. One solution I’ve heard suggested that might actually work is higher insurance premiums for those who choose not to vaccinate, especially if the reason for that change in insurance was explained well enough. Yet, even that may not work. I have hopes that education can work, but those hopes are failing when I learn about how human beings don’t want to be right. Education worked for me, but how normal is that? Not very, according to the studies done on the subject. I think perhaps the best solution is to start teaching kids about vaccines much younger. It may reek of indoctrination, but I think it is necessary for public health, and it doesn’t have to be indoctrination just because it is teaching children at a young age. I think there’s a very good analogy between the vitamins in food products and mandatory vaccinations. Sure, it’s a personal choice whether you avoid iodine and give your child a metal handicap, but it’s going to be very difficult for you to do, because there is salt in pretty much everything, and we’ve added iodine to all of the salt. Malnutrition is not even a public health issue; if I avoid all Vitamin C to give myself scurvy (because I think Vitamin C is a toxin or a chemical or something, maybe), I cannot give anyone else scurvy. If I avoided vaccines and catch mumps, I would probably infect my boyfriend because of the close quarters we live in, and my entire unvaccinated family. They might well spread the disease to co-workers and friends. If we’ve decided it’s acceptable to force everyone to eat far more vitamins by putting them into white bread (among other things), it’s past time we made a similar decision for vaccines. We might even be able to add vaccination to bread, which I would find very convenient!